Mark Singson is a chef & Founder of FAM Inc., living in Vancouver, Canada with a passion for delivering delicious and creative dining experiences. He has a truly unique approach to cooking, by which he finds inspiration in his environment, the arts, and the music that surrounds him. 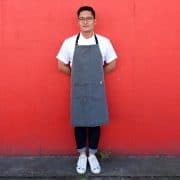 His most recent projects include hosting a series of Family Matters Pop-Ups – where guests enjoy an evening of unique and thoughtfully prepared food and drinks set in a variety of different venues.Previously, Mark was the Sous Chef at the critically acclaimed Annalena, named Air Canada’s Best New Restaurant of 2015. But he has sharpened his skills through years of experience at many prestigious eateries, including: St. Crispin, Vue du Monde, The Oakwood, Boneta, Fairmont Pacific Rim, Coast, and Cactus Club Cafe.